All courses are subject to the availability of funding and to approval by the United States Pay and Fiscal Officer - Iowa. Mobile training offered throughout the midwestern and southwestern United States. MCTC has experienced problems communicating by email with various departments. This is due to our domain being blocked by department email filters. If you do not receive email notification from us when you expect to, please call our office. You may also talk to the I.T. person in your department to ensure that your agency email system is allowing our emails through. The pages within this World Wide Web site are provided by the National Guard Counterdrug Program as a service to the public. They do not necessarily reflect the views or opinions of the National Guard and are not guaranteed to be correct, complete, or up to date. Some links within the site may lead to other sites. The NationalGuardCounterdrug Program website does not incorporate any materials appearing in such linked sites by reference, nor does the National Guard Counterdrug Program necessarily sponsor, endorse, or otherwise approve of such linked material. The courses listed are in the final funding process and open for registration. Registering for a course does not guarantee enrollment, but your registration signals your intent and you should plan on attending the course as indicated. We will contact you as soon as possible if the course is cancelled. 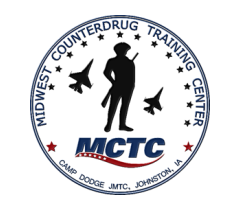 The Chief, National Guard Bureau Counterdrug Office, provides the Counterdrug Office Website as a public service. Information presented on the NGB J3-CD Website is considered public information and may be distributed or copied for non-commercial purposes. Use of appropriate byline/photo/image credits is requested. This government computer system uses software programs to create summary statistics, which are used for website planning and maintenance, determining technical design specifications, and analyzing system performance. For security purposes, and to ensure that this service remains available to all users, this government computer system employs software programs to monitor network traffic, to identify unauthorized attempts to upload or change information, to cause damage, or to deny service to authorized users. Except for authorized law enforcement investigations, no other attempts are made to identify individual users or their usage habits. Server logs are scheduled for regular destruction IAW National Archives and Records Administration General Schedule 20. Unauthorized attempts to upload information or change information on this service are strictly prohibited and may be punishable under the Computer Fraud and Abuse Act of 1986 and the National Information Infrastructure Protection Act.